Biography: Jelena ?iri? was born in Gornji Milanovac, Serbia, in 1985. She received the Ph.D. degrees in medical sciences (veterinary medicine) from Faculty of Veterinary medicine, University of Belgrade, Serbia (Ph.D thesis- Investigation of the effect of different ways package on growth Yersinia enterocolitica in pork meat). She became an Research Associate in 2015. 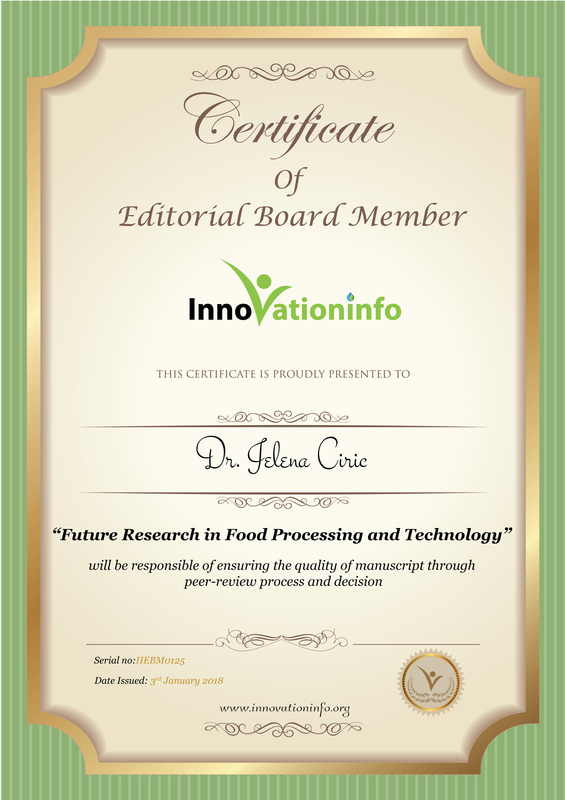 Her current research interests include food safety, food quality, food contact materials, food composition and consumers knowledge of food. Dr. Jelena Ivanovi? ?iri? has been working on research projects Selected biological hazards to the safety/quality of food of animal origin and the control measures from farm to consumer (project leader professor Sava Bunci?). She was member of working groups in the Course of Animal welfare (red meat) supported by RSPCA, the Training on Food Composition and Information (Madrid, Spain) in 2014 and Training on Animal by-Products (Maribor, Slovenia) in 2013, supported by European Commission (Health and Consumer Executive Agency). She has developed experience in academic teaching activities, PhD projects supervision, coordination/chairmanship of national and international conferences. Also, she on the list of reviewer in international and national journals. Her scientific production is documented by more than 40 contributions at national and international conferences and 45 papers in international and national journals.